The above races took place on Sunday 11th November in the Turnpike, Two Mile Borris. First up were the U9 girls in a field of over 90 competitors running 750m. Ciara Joyce was first home for Moyne AC finishing in an excellent 19th position, she was followed by Olive Spillane Leane 43rd, Maria Doyle 51st, Heidi Maher 60th, Isabel Ralph 69th, Roisin O’Reilly 73rd, Saoirse Deegan 78th, Ailis Concagh 83rd and Arlene Flanagan in 88th. The first four girls placed 5th in the club team event. Ciara Joyce and Olive Spillane Leane were home 3rd and 5th for the Tipperary team and were just outside the medals with Tipperary finishing in 4th place. Next up were the U9 boys also running 750m in a field of over 100 athletes. First home for Moyne was Jack Guilfoyle in 59th, followed by David Nolan 75th, Will Walsh 82nd and Daithi Cussen 99th. Jack Guilfoyle was also the 6th boy home for Tipperary but again was just outside the medals with Tipperary finishing in 4th place. U11 girls were next running 1500m with 160 athletes in their race. Alana Spillane led the Moyne girls home in 61st place followed by Dearbhla Gleeson 82nd, Meabh Leahy 85th, Ruth Phelan 100th, Aisling O’Reilly 131st, Kate Tobin 143rd, Ava Tobin 153rd, Isabella Jones 157th and Ellen Nolan 158th. Boys U11 also ran 1500m with 142 athletes in their race. Luke Walsh was first home for the club in 83rd followed by Denis Brolan 93rd, Daniel Tobin 101st, Jack Reddan 107th, Rogan Lyons 113th, Shane Moloney 137th, Bill Cussen 140th and Max Doyle 141st. 4 girls competed for Moyne in the U13 race where they ran 2500m in a field of 123 athletes. Saoirse Doran led the girls home in 82nd place, with Aisling O’Loughlin 111th, Olivia Ralph 119th and Grainne O’Loughlin 120th. 4 boys also competed for Moyne at U13 level where they too ran 2500m with almost 120 in their race. Adam Phelan was first home for the club finishing in 77th place, followed by David Doyle 86th, Adam Spillane Leane 93rd and Jack Flanagan 105th. Mary Cussen and Millie Doyle Ryan represented the club in the U15 race running 3500m. Mary finished 58th and Millie finished 61st. Tomas Cussen was the only member to run in the U15 boys. He also ran 3500m and finished 55th. Emma Gleeson ran in the girls U17 4000m race. 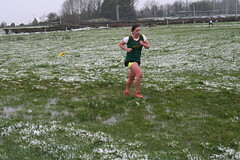 She finished 25th and was also the only medal winner on the day winning a Munster silver medal with the Tipperary team. Ellie Holohan ran the girls U19 4000m race finishing 24th. It was a very tough day with difficult conditions for all the athletes who took park. Well done to all of you for competing and finishing your races. You should be very proud of yourselves. In the Senior Competition we had just one lady representing Moyne. Angela Fogarty, who is in excellent form this year finished in 15th position and was the 6th Tipperary athlete home. Tipperary had a great day, claiming the gold medal in the ladies competition. Well Done Angela and congratulations on the great run! The County Tipperary Juvenile “B”, Novice “B” & Junior Cross Country Championships take place on the farm of Richie Daly this coming Sunday November 4th at 12 noon. Coming from Thurles: At the cross of Moyneard turn right and immediately left and head towards the Lisheen Mine. Approximately 2km down this road, turn right (Follow signs for Urlingford). Follow this road for approx. 1km, where on your left you will turn left and enter the Lisheen Wind Farm Entrance. Follow this road down for 2km to race location. Ample parking provided. Coming from Urlingford: Leave Urlingford on the old Dublin Cork road. At Mary Willies cross turn right (Signed for Lisheen Mines) and drive for approximately 4km where on your right you will turn right and enter the Lisheen Wind Farm Entrance. Follow this road down for 2km to race location. Ample parking provided. Coming from Johnstown/Crosspatrick: Pass the Lisheen Mines and continue to the next junction where you will turn left (follow signs for Urlingford). Follow this road for approx. 1km, where on your left you will turn left and enter the Lisheen Wind Farm Entrance. Follow this road down for 2km to race location. Ample parking provided. From Moyne Athletic Club head back towards Thurles. At the cross of Moyneard turn left. Approximately 2km down this road, turn right (Follow signs for Urlingford). Follow this road for approx. 1km, where on your left you will turn left and enter the Lisheen Wind Farm Entrance. Follow this road down for 2km to race location. Ample parking provided. Best of luck to all our juvenile athletes from U/10 to U/18 and our Novice Ladies and Men as they compete in the County Cross Country Championships in Two-Mile-Borris on Sunday. Over 60 athletes will don the green and gold colours of the club running distances from 800mts at U/10 to 6,000mts at Novice Men. The Tipperary Primary Schools Cross Country Championships take place on Wednesday the 26th of September in Thurles Crokes AC sport’s grounds. See timetable on Tipperary Website for race order and start times. Good luck to all partaking. Day Two (Uneven Ages) of the County Juvenile Cross Country Championships will be held in Moyglass on Sunday 14th of October starting at 12 noon. All entries should be submitted to Ger by 3rd of October. St. Senan’s are hosting an open cross-country this Sunday (30th) in Kilmacow, Kilkenny. There will be races for Juvenile, Junior and Senior athletes and further information is provided on the flier below. Aine Maher was the winner of this week’s lotto lucky dip. Well done and thank you to all who continue to support. There is only more week left to order club tracksuits, t-shirts and crop tops. Order forms can collected in the clubhouse, payment to be made in full no later than the 2nd of October. Well done to Brian Carroll who competed in the half marathon on Sunday. Brian ran a super 1 hour 32 minutes in the Irish singlet. Well done Brian! Inter-Club Cross Country championships will take place on the 21st of September between Moyne AC, Coolquill, Moycarkey and Moyglass in Moyglass at 12pm. Further details will be provided at training on Tuesday. The Tipperary Primary Schools Cross Country Championships take place on Wednesday the 26th of September in Thurles Crokes AC sport’s grounds. Further information to be sent out to schools. County Tipperary Juvenile Even Age and Novice Cross Country Championships will take place on the 7th of October starting at 12pm. The County Tipperary Juvenile Uneven Age and Intermediate Cross Country Championships will take place on the following Sunday, October 14th at 12pm. Entries for both of these events should be given to Ger no later than the 19th of September. Final orders for club gear this year should be submitted no later than October 1st for club tracksuit, crop tops and jerseys. Order forms can be collected at the club house on training nights. Athletic Ireland’s National Children’s Officer, Kieron Stout is hosting an Information Evening for County Tipperary Athletics Clubs on Wednesday 19th September in Thurles Crokes A.C. at 7pm. The purpose of the meeting is to spend time looking at Club requirements under the Children First Act 2017. Club Training has resumed for all athletes aged six years and over at 7:30pm every Tuesday and Friday. All new members are welcome. Inter-Club cross country championships will take place on the 21st of September between Moyne AC, Coolquill, Moycarkey and Moyglass in Moyglass at 12pm. Tipperary Sports Partnership are holding their annual Tipperary Mini Marathon (10k) on Sunday 30th of September in Thurles at 11am. Entry on-line or via postal entry. Entry fee €20. Additional cost €1.50 for on-line entry. Closing date is Monday 24th September. Course details are accessible online. The Munster Juvenile Even Age, Novice & U/23 Cross Country Championships will take place in Beaufort, Co. Kerry on the 21st of October. Any interested athletes should register by October 9th with Ger. St Senans AC Open Cross Country takes place at the sport’s centre in Kilmacow on the 30th of September starting at 1pm. Events for juveniles and senior. The Autumn Open Cross Country Festival takes place on the National Sport’s Campus on Sunday the 21st of October, starting at 2pm. Full details available online at the National Sport’s Council website. Brian Carroll competes in the World Master’s Track and Field this weekend. Brian competes this Sunday (16th) at 8am in the half marathon. Good Luck Brian! Athletic Ireland’s National Children’s Officer, Kieron Stout is hosting an Information Evening for County Tipperary Athletics Clubs on Wednesday 19th September in Thurles Crokes A.C. The purpose of the meeting is to spend time looking at Club requirements under the Children First Act 2017. Any interested club member or committee member are welcome to this event. See the Tipperary Athletics website for further information. Pole Vault Workshop will take place on the 16th of September from 11 am to 3pm in Templemore. This workshop is for Beginners aged 12 and over. The day costs 5 euro per athlete. Any interested athletes should email eflanpolevault@gmail.com in advance to secure a place. Sunday 23rd September in Templemore Track at 11am. For athletes aged 12 years+, all are welcome and costs 5 euro per athlete. Long Jump (Pat Power), High Jump (Barry Pender), Triple Jump (David Murphy) & Pole Vault (Eamon Flanagan). Contact Pat Power @ jumps@athleticsireland.ie to register. Well done to Aisling Maher who has won this week’s lucky dip. Brian Carroll hasn’t too long to wait now as the World Masters T&F Championships take place from 4-16th of September in Malaga. He will be competing in the O35 Half Marathon on September 16th. We are very proud that he will be flying the flag for Moyne and Ireland. Best of luck Brian! Well done to Liam Kelly who finished 2nd in 17:44.5 in the 5k road race. Pakie Bowe finished 11th in 19:27.9 and Ronan Ely was 21st in 24:13.2. Cathal Ely ran in the 10Km race finishing in 42:26.5. Great running by all! Training continues for adults, who wish to improve their fitness, every Monday, Wednesday and Friday at 7:30pm. While there are athletes training for the upcoming cross country season, there are also those who want to improve their fitness. All levels of ability are welcome to join the group. Cross country training is in full swing for children aged 8 and upwards wishing to compete in the forthcoming season on Tuesday and Fridays at 7:30pm. The first outing for these athletes will be October 7th in Two Mile Borris followed by Moyglass on October 14th. Training for younger athletes and those not competing in cross country will resume shortly. Anyone interested in purchasing club gear are asked to contact Sharon Cantwell. The order forms are available in the club house. In addition to the zip tops and bottoms, t-shirts and crop tops (for female track runners) are available to order if the demand is great enough. This order will be placed by early October so don’t delay. Congratulations to Willie Moore (Moyne) who was the winner in the lucky dip this week. The Tullamore Quinnlan Cup Half Marathon was held on Saturday the 25th of August in Tullamore, Co Offaly. Brian Carroll ran 1:29:35. Well done Brian. Orders will be taken for club gear including tracksuit, crop-tops and t-shirts this month. All orders should be made before the 2nd of October via order forms that are available at the clubhouse. Contact Sharon for further details. Training for adults will begin this Monday night 26th August at 7.30pm. All are welcome – from those who are interested in competing in cross country to those who want to run to improve their fitness. Training will continue on Monday, Wednesday and Friday nights for this group.